Home / Food Prep / Commercial Mixers / Stand Mixers / Globe SP20 Planetary Bench Mixer, 20 qt. The perfect mix of value, performance and durability! The heavy-duty gear driven transmissions easily mix all kinds of products, and front-facing controls allow you to track your batch from across the kitchen. 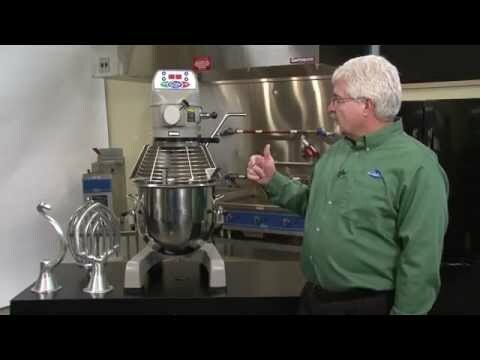 Globe"s SP20 Planetary Bench Mixer gives you more mixing power and capacity than countertop mixers, with high-torque, gear driven transmissions and rigid, cast iron bodies. 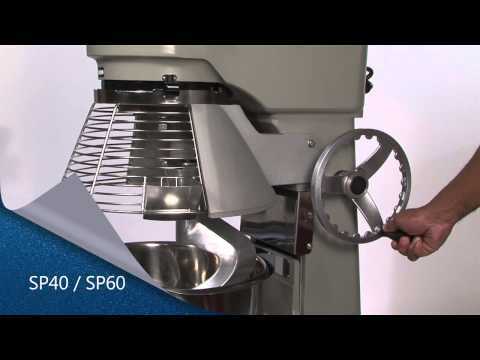 Globe's SP20 is made to hold up to 20 quarts per mixing batch. This mixer features front mounted controls, 3 speeds and a 60 minute timer for accuracy and easy control. Mixer includes a stainless steel bowl with a built-in ingredient chute that is easily removable using the interlocking bowl lift. The mixer also includes non-slip rubber feet for stability and a stainless steel wire whip, an aluminum dough hook, and an aluminum flat beater with a #12 hub attachment. This product measures at 34.5 inches high by 18.25 inches wide by 19.5 inches deep. Interlocked bowl lift, NSF, cETLus, 6 Amps, 1/2 HP, 115v/60/1, NEMA 5-15P, 6 foot cord.